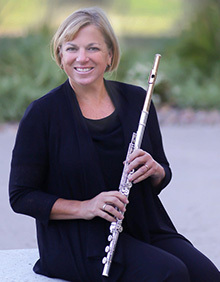 Andrea Artley became Adjunct Professor of Flute at CSU-Pueblo in 2014. From 1987 until 2013, Andrea was a flutist with the U.S. Army Band "Pershing's Own" in Washington, D.C. From 2000 to 2013, she was principal flute and soloist with the organization performing in venues across the U.S., Europe, and China. During her years with "Pershing's Own," Andrea was an active chamber musician, performing at the White House, Capitol, State Department and the Library of Congress. Andrea earned a degree in flute performance from DePaul University in Chicago. She resides with her husband and two children in Monument, Colorado. Andrea performs regularly as Co-Principal Flute with the Pueblo Symphony. She also plays with the Steamboat Symphony and has been a substitute flutist with the Colordo Springs Philharmonic. Ms. Artley collaborates with guitarist and CSU-P faculty member, Ben Johnson. Their duo, The Mountain Aire Duo can be heard in recital throughout the area. Andrea Artley is a Miyazawa Performing Artist.